With over $495 in net sales as of January 2018, and over $4.5 billion coming from Membership and other income. 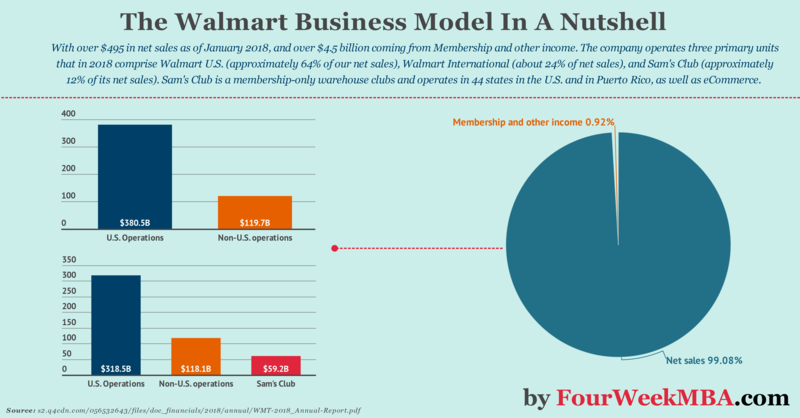 The company operates a business model with three primary units that in 2018 comprise Walmart U.S. (approximately 64% of our net sales), Walmart International (about 24% of net sales), and Sam’s Club (approximately 12% of its net sales) a membership-only warehouse clubs and operates in 44 states in the U.S. and in Puerto Rico, as well as eCommerce. How does Walmart distribution work? Everyday low cost (“EDLC”) is Walmart’s commitment to control expenses. Those savings can be passed along to customers. Walmart has an omnichannel presence to provide customers access to a broad assortment of goods at any time and in many locations in the US and internationally. Besides its physical infrastructure, Walmart has also been investing in its digital platforms, based on eCommerce. Walmart International consists of operations in 27 countries outside of the U.S.
Walmart International generated 7 approximately 24% of 2018 net sales. Sam’s Club consists of membership-only warehouse clubs which operates in 44 states in the U.S. and Puerto Rico, as well as eCommerce. Sam’s Club accounted for approximately 12% of 2018 net sales. As a membership-only warehouse club, membership income is a significant component of the segment’s operating income. Health and wellness include pharmacy, optical and hearing services and over-the-counter drugs. Supercenters occupy a larger area, compared to discount stored and neighborhood markets. As specified in its annual report Walmart can develop, open and operate units at the right locations and to deliver a customer-centric omnichannel experience. That largely determines its competitive position within the retail industry. Walmart employs many programs designed to meet competitive pressures within its industry. Money Back Guarantee: ensure the quality and freshness of the fruits and vegetables in Walmart stores by offering customers a 100 percent money-back guarantee if they are not satisfied. For 2018, approximately 78% of Walmart U.S.’s purchases of store merchandise were shipped through 157 distribution facilities, located throughout the U.S. The remaining merchandise gets shipped directly from suppliers. At the international level, Walmart utilizes a total of 188 distribution facilities located in Argentina, Brazil, Canada, Central America, Chile, China, Japan, Mexico, South Africa, and the United Kingdom. Through these facilities, Walmart processes and distributes both imported and domestic products to the operating units of the Walmart International segment. By January 2018, approximately 83% of Walmart International’s purchases passed through these distribution facilities. The principal focus of Sam’s Club’s distribution operations is on cross-docking merchandise, while stored inventory“>inventory is minimized. Cross-docking is a distribution process under which shipments are directly transferred from inbound to outbound trailers. In short, shipments typically spend less than 24 hours in a cross-dock facility, and sometimes less than an hour. Sam’s Club uses a combination of our private truck fleet, as well as common carriers, to transport non-perishable merchandise from distribution facilities to clubs. The segment contracts with common carriers to transport perishable grocery merchandise from distribution facilities to clubs. Sam’s Club ships merchandise purchased by members on samsclub.com and through its mobile commerce applications by a number of methods from its dedicated eCommerce fulfillment centers and other distribution centers. Next Next post: What Is The Best Business Model For A Small Business?